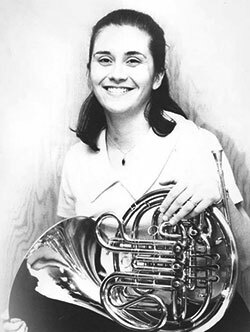 Nancy Jordan Fako (born 1942) became a member of the Chicago Symphony in 1964, the first female horn player in a major orchestra since Helen Kotas left the Chicago Symphony in 1948. She was also a mainstay of the IHS in its early years, becoming Secretary-Treasurer and handling correspondence and records, all without the aid of computerization until 1976 or of an executive secretary until 1979. The IHS is incorporated in Illinois because it was Nancy’s residence. She served four terms on the Advisory Council (1974–1981 and 2000–2008) and was secretary-treasurer in 1974-77 and 2000-2008. Nancy studied with Philip Farkas in high school and at Indiana University, collaborated with him on The Art of Brass Playing, remained a close friend and colleague throughout his life, and after his death (at the request of his widow) wrote a biography, Philip Farkas & His Horn: A Happy, Worthwhile Life (Crescent Park Music Publications, 1998). In addition to the Chicago Symphony, Nancy has been a member of the Houston Symphony, the Florida Symphony, and the Chicago Lyric Opera Orchestra. She was principal horn in the Florida Symphony at age 20, the first female brass player in the Houston Symphony at age 21, and a member of the Chicago Symphony at age 22. Nancy is now a freelance horn player and teacher. She plays the alphorn at many festivals, including taking part in the Alpenfest in Gaylord, Michigan for over 25 years. She has contributed to professional journals (including The Horn Call) as a writer and as translator for several languages. She translated Daniel Bourgue's Conversations About the Horn from French to English. Nancy received the Service Medal of Honor in 2012 and was elected an Honorary Member in 2016.